Visiting a Hero It was the last full weekend in August. Finally, we heard that four out of the five of our family were granted visitor status at the Federal Correctional Institute McKean in Bradford, Pennsylvania. We had been corresponding with a prisoner there. Ren� Gonzalez Sehwerert. We had learned about the circumstances leading to his imprisonment while three of us were participating in the Caravan to end the blockade of Cuba with Lucius Walker and Pastors for Peace last summer. 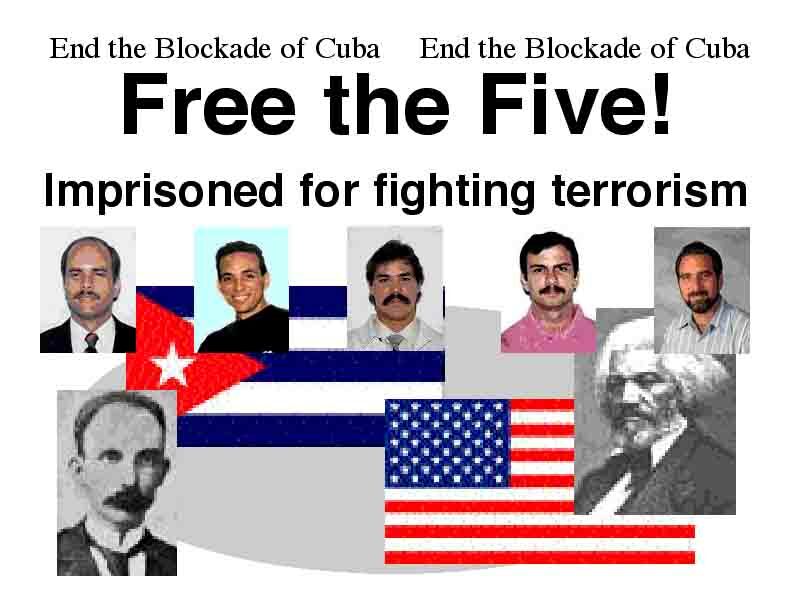 My sons, Emile, Sebastian and I had the honor to hear the President of the Cuban National Assembly Ricardo Alarcon describe the events that lead to the brutal, unjust arrest and imprisonment of the five anti-terrorists. In that moment, we committed ourselves to raising the consciousness of the American people; exposing to them the corrupt and hypocritical policies of our government in its mistreatment of these truly heroic figures. Saturday morning we arrived at the lobby of the prison. Everyone was nervous; the shining sun was the only bright thing about approaching this barbwire-covered, ultra-fortified, bleached block complex. Everyone passed through the metal detector; there was another family there and several other visitors. We each received a stamp on the hand with invisible ink and each adult was allowed a small amount of cash to purchase food from the vending machines. Every door we went through our ink stamped hands were checked again with a black light. After a short walk in the sun between two structures, we entered the visiting area where they checked us again and assigned seats where we must sit and wait for the person we were visiting. Forty-five minutes later in walked Ren�. We had seen his picture many places, so his smile helped us recognize him inspite of the fact the beard and mustache were gone. We jumped up and greeted this most honorable guest in our humble state. His fatherly qualities were obvious and abundant as he immediately made the children feel at ease. His own wife and children are refused a visa to enter the USA to visit. September 12th will mark four years since the jail door slammed, shutting him in. We spoke of our conditions, the trip there. This is a beautiful part of Pennsylvania, where the forests and mountains are as plentiful as the struggle against injustice in the states long history. Ren� is accustomed to struggle. He is a veteran of the defense of Angola, (Cuba answered the distress call from that African nation and helped repel the apartide South African army in its effort to subjugate those peoples, it was a defining moment in the fight against imperialism) and the proud father of two daughters, four and 18 years old. Not to mention the first 17 months in solitary confinement spent in a Miami torture chamber. Four hours until the end of the visiting period seemed to just disappear. We shared experiences, our fears and joys, hopes and sorrows, little things that only seem important at this moment, big things that are essential for understanding and survival of the human race. Small children played and laughed around us, concealing the brutality of the environment, piercing the fog of oppression that permeated every nuance of the adult relationships. Men caged and severely restricted in every movement and experience. We walked over to the soda machine to buy lemonade and I had to pick up the bottle for Ren� because the rules forbade him from crossing the red line on the floor 50 centimeters from the machine. Here in the town of Bradford Pennsylvania we were surrounded by monuments to the industrious energies of generations of working people, paper mills, manufacturing factories, gas wells and coal mines, all the products of human labor. Energy harnessed by the coercive devices of a system founded on the backs of slavery, super exploitation and the oppression of masses of working folk for the benefit of a few. We were inspired as we parted with this giant of a people who accept as their moral compass human responsibility. Ren� Gonzales, patriot of Cuba, is the breathing example of cooperation for the benefit of all, his humility was intoxicating, poisonous to the media-induced numbness we are force-fed each day. The US government may choose to cage and abuse this ambassador of a just and peaceful world; we left dedicated to the struggle of emancipation from just such oppression.